If the level of the healing ridge is too far corbnal for an esthetic pontic, the anatomical topography of the site must be determined by needle probing under local anesthesia. If there is a thickness of 3 or 4 mm of soft tissue above the alveolus in the center of the ridge, it is necessary only to perform soft tissue gingivoplasty, developing an anatomical configuration compatible with the two adjacent teeth. This is easily accomplished with a rotary diamond instrument. A 1 mm concavity for the base of the pontic, further apical to the maximal curvature of the adjacent marginal gingiva, is developed. To fit into this area, the temporary pontic is relined with self-curing acrylic, trimmed, and polished, allowing the tissue to heal around this ovate form. If the needle probing reveals a soft tissue depth of only 2 mm, a surgical procedure with osteoplasty of the ridge is invariably necessary to develop the ideal pontic recipient site. A full thickness mucoperiosteal flap is raised and the edentulous ridge is fully exposed. The flap is raised from the palatal aspect to prevent any subsequent unesthetic labial scarring. The interproximal tissue on the abutment teeth is not included in the dissection to ensure the constancy of the crown margin-to-tissue relationship. The “trapdoor” of tissue is gently dissected towards the labial and the osteoplasty procedure performed. Depending on the type of pontic to be used, the flat osseous ridge is reshaped in one of two ways. Ovate Pontic- The flat ridge is reshaped so that when viewed from the direct buccal aspect, it is in harmony with the scalloped osseous form of the adjacent teeth. Next, a depression I mm deep and 5 mm in diameter is created midway between the two abutments in line with the central fossa. Modified Ridge Lap Pontic – The flat ridge is decreased in width from the lingual aspect only, allowing the pontic to make contact predominantly on the buccal aspect, thereby facilitating oral physiotherapy. For esthetic reasons, an indentation is then created on the buccal aspect which permits the placement of a pontic which is not in extreme labioversion and which blends in with the adjacent teeth. The flap is sutured in position over the reshaped alveolar ridge (the pontic recipient site) and held by the pontic in close apposition to the concavity. Healing will result in either a pontic recipient site which is concave in both a buccolingual and a mesiodistal direction, and into which the ovate pontic can fit, or in a pontic recipient site of correct dimension to accept a modified ridge lap. Teeth with no antagonists invariably erupt into the space in the opposing arch, bringing the alveolus and attachment apparatus with them. If, for any reason, these teeth are lost at a later stage, the resulting edentulous area or potential pontic recipient site will be at a level coronally lower than the adjacent teeth. In such situations, the ostectomy and osteoplasty procedures necessary to recreate a dimension capable of receiving esthetic functional pontics will be identical to those described above, but far more radical. The deformed pontic area or collapsed ridge has long posed a severe problem to the esthetically conscious restorative dentist. Due to the many factors involved in tooth loss, areas where teeth have been extracted can resorb severely, resulting in bizarre anatomical deformities which are ineffectively compensated for prosthetically. The bone loss in any localized pontic area can be considered to be one of two distinct types: vertical or horizontal. In vertical resorption, the resulting ridge is considerably shorter in an apicocoronal dimension than that of the adjacent teeth. In the second type of bone loss, the resorption is more horizontal, taking place when the buccal plate is lost, and causing a concavity in a buccolingual dimension. Either type of bone loss results in an unesthetic situation in which the pontic needs to be considerably oversized as compared to the adjacent teeth. To date, several methods have been utilized to attempt to compensate for this problem. 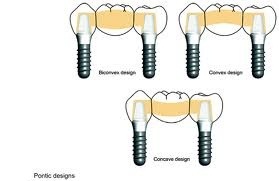 The first, and simplest, solution is to place a pontic that blends as well as possible into the edentulous area. For more severe deformities, it may be necessary to add pink-colored acrylic or porcelain to the apical end of the pontic to simulate normal gingivae. 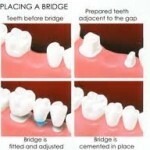 A third solution is to make a portion of the prosthesis (the gingival tissue) removable, as with an Andrew’s bridge. Several distinct types of surgical procedures are available for treating the deformed residual edentulous ridge, depending on the nature of the deformity. Loss of Dimension of a Vertical Nature – Two periodontal surgical plastic procedures are presently utilized to augment ridges with a predominantly vertical deformity.